INTRODUCING The NEW Challenger 1000 Series Tractors! The WORLD’S FIRST 500+ HP FIXED-FRAME TRACTOR! CLICK HERE TO LEARN MORE OR SCHEDULE A DEMO! Introducing the MT700 Series with CVT track tractors. The MT700 Series inherits common architecture from the Challenger 1000, the most technologically advanced tractor available today. Engineered with all the capabilities Challenger is known for, along with an innovative suite of on-board intelligence upgrades developed to boost productivity and decision-making for your operation, the MT700 Series has been designed with two things in mind — you and your business. Featuring an Acc-VTTM Transmission, providing optimal coordination with the engine for peak performance and productivity across multiple applications. During field operations, torque is transferred flexibly, resulting in tremendous pulling power. The best ton-for-ton tractor just got bigger and stronger and now delivers even greater horsepower than ever before. The MT700E Series features the AGCO POWER, 9.8L engine armed with up to 400 hp for tackling the most demanding conditions with unmatched lugging ability for maximum productivity. All models feature the exclusive Mobil-trac undercarriage system, which keeps you in constant contact with the ground for better traction and reduced slip. The MT600 Series are productive tools designed for maximum fuel and operator efficiency.They represent the combination of power, comfort, technology and pure performance that you™ve come to expect from a name like Challenger. 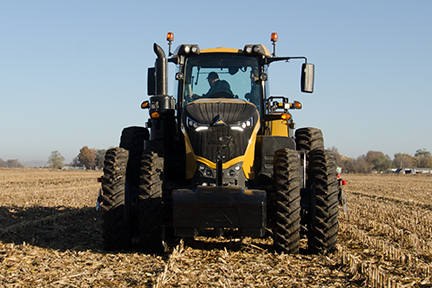 All MT600 Series tractors are equipped with AGCO Power engines, which guarantee precision power and high performance. The TechStar, CVT (Continuously Variable Transmission) is standard on all models, providing variable speed control with optimum power,engine speed and fuel efficiency, resulting in a significant gain of output and productivity. *110 PTO HP MT525D comes with the AutoPower 6 transmission and the TechStar CVT. The 120 PTO HP MT525D comes with the AutoPower 4 transmission. The rugged and reliable Challenger MT500 Series takes on your toughest jobs with the power to quickly turn them into finished jobs. Their strength comes from the AGCO Power Tier 4i compliant engine with e3 SCR clean-air technology, which features four valves per cylinder and a new injector location for even more efficient combustion. The TechStar CVT is a clutchless, stepless transmission, which means less maintenance and a truly smooth ride. The industry-exclusive power management helps the engine and transmission work together on the most efficient setting. Each MT400D tractor offers multiple configurations and options to tailor the machine to the exact needs of the job at hand. The entire line-up boasts an EPA Tier 4i compliant 4-cylinder engine from AGCO Power and ranges from 90 to 120 PTO HP. Designed with comfort and versatility in mind, the MT400D tractors are an ideal fit for loader work, hay production, planting, tillage and general on-the-farm use. Each model is available exclusively in a cab configuration and 4WD front axle.